It’s interesting how one project can morph into several other projects. That is clearly the case around our house recently. Our bathroom remodeling project is in full gear. To help with the clean up the contractor brought a large trailer to haul away debris. 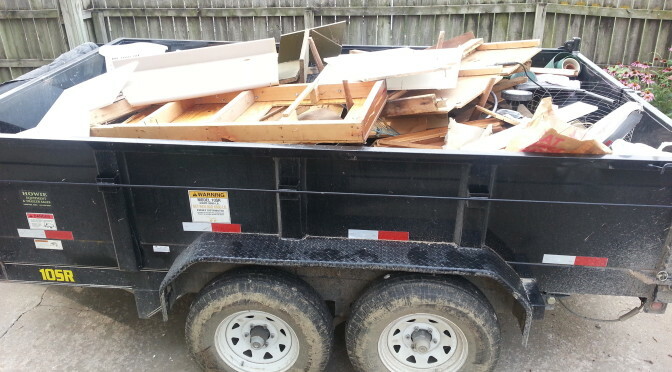 Since he wouldn’t be needing to put much in it he said we could fill it with anything we wanted to get rid of. It was a great opportunity to declutter which is something I’ve so far been trying to do when I use filing cabinets to maximise storage. Little did he know that cleaning out the garage of years of junk was something we had been wanting to do for quite awhile but had been putting off. How could we not clean it out now? There was an almost empty trailer setting right in front of it. When you eventually do the tasks you’ve been putting off for a while, you feel like you’ve achieved something. Now we can actually see what’s in our garage. Plus, we can finally put the trailer in there, instead of sitting right in front of it. There’s something else that the garage needs and that is to get the door fixed. As we have been neglecting it, we didn’t realise the door wasn’t working as it used to. I was speaking to a few friends who recommended we looked into companies such as Coastal Garage Doors to provide us with the best results when it comes to repairing our garage door. After this, the garage will be perfect! The garage isn’t the only place we’ve been cleaning. Our garden shed got the purge treatment too! There were doors, snow fence, and chicken wire in it left by the previous owner 16 years ago that we never bothered to get rid of. That’s all gone now. There’s also one place in the house that we had to clean… our craft closet. It’s an old coat closet that I outfitted with shelves from the floor to ceiling to store craft supplies. At the top of this closet is where our attic access is. In order to install some lights and an exhaust fan our contractor would need to get in the attic. That meant taking everything out of it. The perfect opportunity for a complete overhaul of the closet! It has been tiring work cleaning up everything and clearing away the clutter. It’s also been a little mentally draining too. It’s somewhat frustrating to see things that at one point we thought were important that years later are now deemed junk. The bright side is that we are past the point where it seems like we’ll never make any progress. The big stuff is done. Now it’s down to some fine tuning. I’m excited for the possibilities for our garage. I can see myself working on projects out there now. Something that would have been impossible a week ago. It really does feel good to clear the clutter and I wish we would have done it sooner. I think we were just too overwhelmed to “start” so we never did. I’m glad our bathroom project gave us the kick in the pants that we needed. Are there areas where you need to clear the clutter? Pick a small area and start. Trust me. You’ll be glad you did.